Nice.. As every blacksmith house should be.. Doggy, doggy blankets. burn resistant rug, and wait for it.. Tools on the floors or anvils in the kitchen..
You have heat in your shop.. LOL..
Poor little me.. I'm heat less in the trailer.. I keep saying the new shop is going up for the teaching facility. but each year it gets pushed out.. Once that happens it will be heated.. then I can film away from the Pellet stove..
Jen this is what I was talking about. I understand what you are saying and will get it hot and attempt to work opposite the straight side. Thanks for your help. So, you have the upset going to one side.. In this follow up image read top left, top right (showing the correction) be careful about a cold shut with that little folding action you have on the upper side..
Lower left is corrected.. And then flatten the edges so they are not so sharp.. Ideally you always want to keep the upset centered to the main mass or center line of the bar.. This will keep the metal even around the center of the bar you are upsetting.. Looking fowards to the next pictures.. Post back with what you get..
Again the best practice is to keep the upset centered to the main mass or center line of the bar..
first picture is perfectly pushed back..
More than likely you will have more like second photo.. You will push it back and the side that is offset now will end up pointing more like #3 in photo 2.. At this stage taper it again so it is centered and start upsetting again.. The bar got a little out of hand or ahead of you.. Best thing is to correct constantly as you work..
A perfect place to use a rounding hammer, and do it on the face of the anvil, not the horn. Rotate it so the offset curve is down, use a 2 point contact on the parent stock to anvil face, and use the rounding hammer to center the curve on both sides. 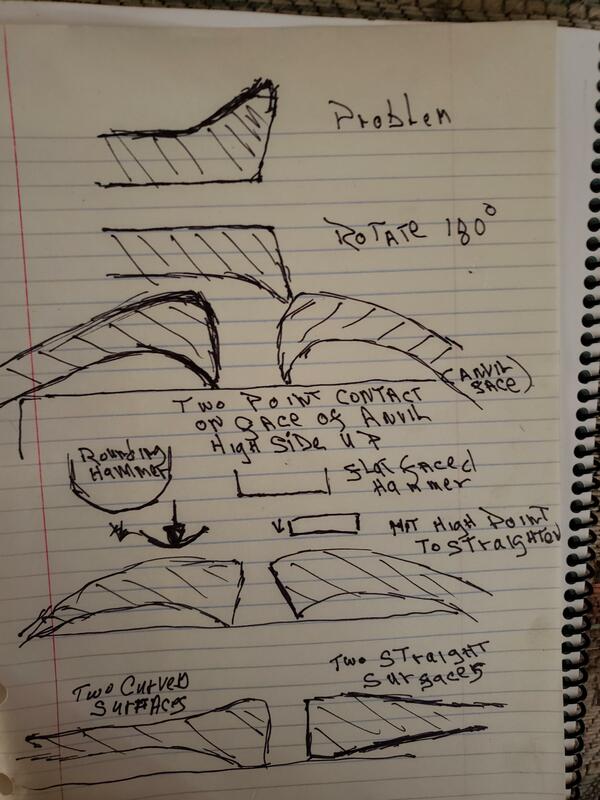 I use this technique very consciously when drawing a taper with both lengths curved. You can also use this to get a convex curve on one side, and a concave curve on the other. If this doesn't make sense, I'll post pics when I get home. bridging can certainly be used to good merit as Rounding a shoe or pulling a shoe but this is a very short area off center..
And with a heavy bar and such a short long side vs short side I still feel the horn method will offer the least distortion simply by pushing the long side back ove as in the original drawing or as in figure 4 #2.. If I understand what you wrote as using the rounding hammer to bridge and then push back, the Other thing is when pushing the offset (LOng side) back the bar will have to be held off the anvil as in rounding a shoe... and this will put a lot of pressure into the hand, wrist, elbow and shoulder so if someone has a problem all ready this can be painful.. Or if bridged (drawing 2) (run the risk of a cold short where it rests on the anvil edge or total distortion of the tip which will be against the anvil face) running the risk of including the dent from the side face as the upset continues.. Sorry I took so long to respond. I wanted to do a vid, but mother nature intervened. I've got 3' of snow over my tools and the carport is now the mechanics shop. So a pic will have to work. Actually, what i said has nothing to do with rounding a shoe, it is just applying a rounding hammer , not a ball peen or a flat faced hamme , to straighten on the face of the anvil. Thats a 2 point contact and high side up. Then use vertical blows to straighten. Pretty straight forward. The farrier technique you are talking of is a 2 point contact on the horn, and strike the iron beyond where it contacts the anvil. Thus turning or bending the shoe. And I have no idea what you mean by "pulling the shoe". the Other thing is when pushing the offset (LOng side) back the bar will have to be held off the anvil as in rounding a shoe... and this will put a lot of pressure into the hand, wrist, elbow and shoulder so if someone has a problem all ready this can be painful.. Or if bridged (drawing 2) (run the risk of a cold short where it rests on the anvil edge or total distortion of the tip which will be against the anvil face) running the risk of including the dent from the side face as the upset continues..
Again we have talked before of "pushing iron". 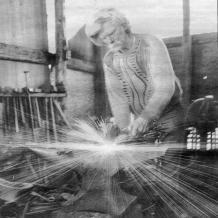 I don't "push iron", i forge it or I bend it, and generally with blows that are in the vertical. Just this alone as a general rule, will keep your body safe. Again, I have a 2 point contact on the face of my anvil, high side up. Thus no problem of improper pressure anywhere. I know you are sensitive to this. Seems you have said you were down for 2-3 years after quitting your hardware business back in your early 20's and couldn't raise your arm over your head!. As for a cold shut, nope, that wont happen for 2 reasons. first, my anvil edges have a radius about 3/8" to 0" from the step to about where the heel begins, and second, get it hot where you want to bend it and don't get it hot where it might get dinged. This is called heat control, for those who aren't aware. As to distorting the large end, in this case, its not a problem as it will get more upsetting after correction. thus thats not an issue. No critique, different technique. And a technique that most, even experienced smiths, are not aware of. That is using a rounding hammer for its named purpose,,, to Round either convex or concave. So, Jen, in truth I had two reasons for this post. The first was to show the OP another technique to get to the same end as your example, oranges and grapefruit. The second was to introduce a technique that i feel many smiths are aware of. And that was to show a solution to a problem using a rounding hammer for the very reason was named,,,, wait for it,,, a rounding hammer creating a "round". Anvil: Striking a curve arched UP to correct the curve is the same technique as a farrier uses to adjust a shoe, Jennifer was just using a different example not disputing the technique. Personally I use two round steel bars, one as a bottom die inn the step the other as a top die and avoid needing to straighten shapes like this. Even if you're only making one top tool the round stock I use as the dies just goes back in the rack when I'm finished with it. 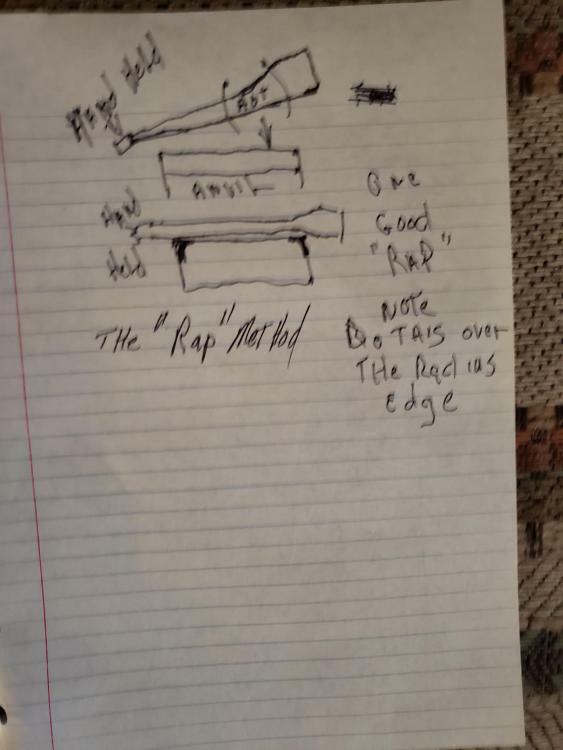 i don't see the difference between my sketch and yours other than you show your bar with a squared end on the anvil vs what the bar was shown as.. But hey.. You can do it your way.. Its all good.. I still stick with my original suggestion as the way of doing it with the bar shown.. Enjoy.. Striking a curve arched UP to correct the curve is the same technique as﻿﻿﻿﻿﻿ a﻿﻿ farrier uses to adjust a shoe, Jennifer was just using a different example not disputing the technique. Sorry for any misunderstanding. I was not disputing anyone. I presented a different way of solving the problem, Jen replied and presented possible problems, which is appropriate for anyone to do. I answered her critiques. I indicated I did not understand something she said and, i still dont understand what she meant. Jen, to answer your question, the end of the bar is not important, three of us now have presented ways of dealing with the problem. That's recentering the upset with the parent stock. 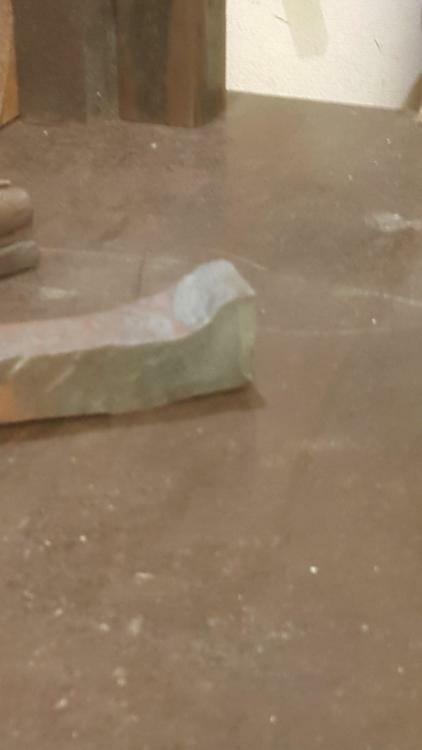 Another way of solving this problem, if your parent stock is long enought to hold in your hand,, dont use a hammer at all, just bring the stock down hard on your anvil with the upset hanging over the far edge,, one sharp rap, and the problem is solved. Alas, we are learning just why an upset can be an upsetting experience. And, most importantly, showed a use for a rounding hammer that many have never considered. Isn't that why we are here? Answer questions, Present our knowledge, give solutions to critiques, and give choices to others in order to increase their skills? So, Jen, when I show a different solution, it's no critique on you, its just another solution. Please dont take offense. I agree the rap method is valid... Use it quite often for other things besides upsetting to.. Just handy and it works..